The primary applications employed in the project are MAX/MSP, Mrmr, and Openframeworks. The sound component is developed with MAX/MSP, Ableton Live, and Max for Live. The visual is created with Openframeworks (OF). 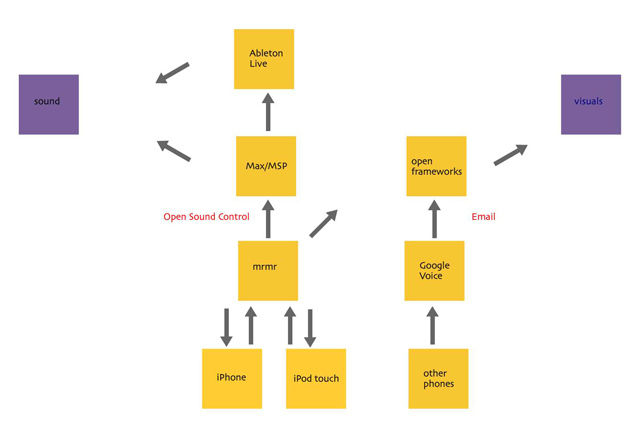 Iphone and iPod touch users communicate with the performer via Open Sound Control messages (OSC). 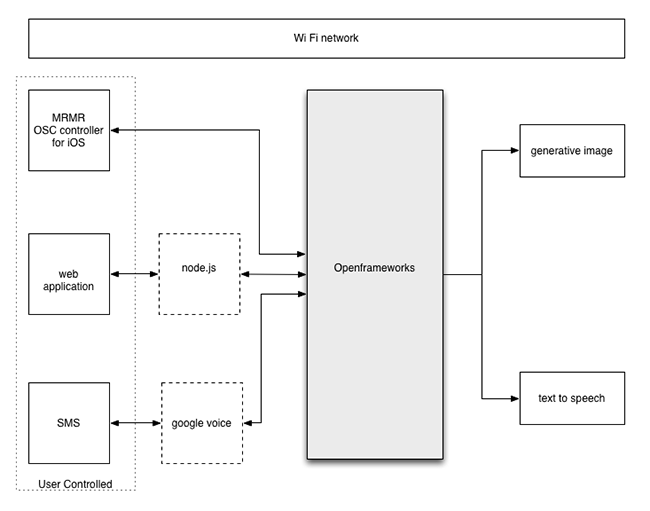 OSC is a protocol permits communicate data over wi-fi network. At first, OSC messages from each users’ phone via Mrmr interface is sent to OF. Then, OF relays the same OSC signal to Max/MSP via another UDP port. OF manages graphics and computer voice, and Max/MSP controls sonic elements. None iPhone or iPod touch users are able to send sms messages to participate. User’s sms messages is sent to OF and results text and sound in the same way as OSC messages. The background music and interactive sound are composed and activated in Ableton Live. Max for Live is incorporated to process midi and audio in Ableton Live as well as receiving midi data from Max/msp.